Paolo Staccioli — Kiesendahl + Calhoun Fine Art, Ltd. 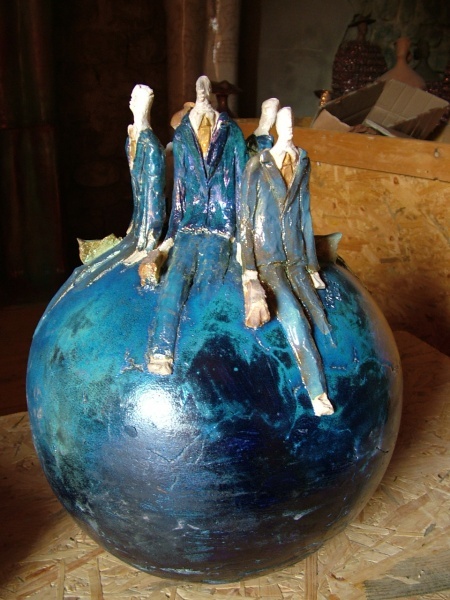 Sphere 3, ceramic, 11" circum. 18"h x 7"w x 7"d. ceramic. 28"h x 7" w x 6.6" d, ceramic. Red Stele with horses and "putti"
Flask I, ceramic, 13"w x 3"d x 13"h, two sided images. 19"t x 20.5" w x 8.3" d, ceramic. 18" h x 9" w x 9" d., ceramic. Spheres and toy horses, ceramic. Paolo Staccioli, born in Scandicci, near Florence Italy in 1943, began his artistic career painting and presented his first one man exhibit in 1973. 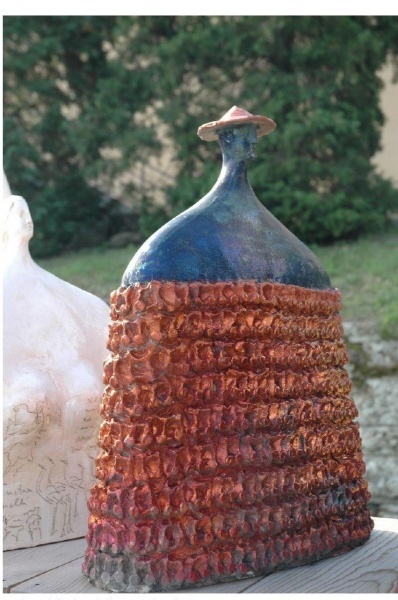 His experience in ceramics dates back to the late 1980s with terracotta bas reliefs. He experimented with glazes and learned the technique of oxygen reduction firing under the master craftsman of Faenza, Umberto Santandrea, where he began research on lustres, employing clays, oxides and salts. Giving up painting, he decided to dedicate himself to ceramic work. In the late nineties and 2000 he moulded a large horse ridden by a winged putto, which was cast in bronze and inaugurated the Museum Park of Poggio Valicaia. Staccioli has exhibited in Belgium, Holland, France, England, Italy and Japan. From October 2005 through June '06 he exhibited at the Museo delle Porcellane at the Pitti Palace in Florence. In 2002, On the occasion of the Dutch crown prince's wedding, a well known art gallery in the Hague presented the couple a beautiful Staccioli vase. Thirty five of the artist's vases are in the collection of the Sultan of Brunei. Staccioli works in Scandicci and Montelupo on various forms and such characters as his Travellers, Warriors and Cardinals. His work shows the influence of the artists Martini, Giacometti, Marino and Fantoni. The horse is a subject which Staccioli revists over and over in whichever form he is sculpting. At times his horses seem like borders, on vases or spheres, of ancient cuneiform writing. Taking a closer look, we see the horses are on wheels, like a Trojan or merry-go-round horses. His horses and other forms ressurect ancient history - from the cave to Etruscan times. In March to April 2008, on the occasion of his inaugural exhibit at the Italian Cultural Institute in New York, Kiesendahl+Calhoun is representing Staccioli thanks to the association with Galleria Paradigma of Florence, Italy. Photos of Bronze Warriors courtesy of Centrica SRL Florence, De Paoli Edizioni D'Arte. born in Scandicci, near Florence Italy. first solo exhibit as painter. Created large bronze horse ridden by winged putto, Museum Park of Poggio Valicaia. Palazzo Pitti, (Pitti Palace) Florence, solo exhibit at Porcelain Museum, Galleria Paradigma, Florence. 2007 Museo Archeologico, Fiesole: ceramics and bronzes - solo exhibit amidst antiquity. 2007 - 2010 LongHouse Reserve, East Hampton, NY: 2 6 ft. bronze warrior figures. 2009 Italian Embassy, Washington DC solo exhibit.